I know, I thought, I'll crack out a quick brayered background using rainbow inks .... ha ha .... not likely. I've single-handedly managed to cause a large area of deforestation with my failed attempts as I couldn't get an even result if my life had depended on it! I've watched it demoed, bought a new soft brayer and was convinced this was a fool-proof method which would furnish me with a great result. In the end, I sponged the sun .... (you know, thats the orangey-yellow orb in the sky that only seems to put in a rare appearance) ....by hand! See, now I'm not using the dictionary pages .... I'm lost. Hope all will be more successful after a nights sleep. I think I was dreaming of sunnier climes when I made this little beach hut number! 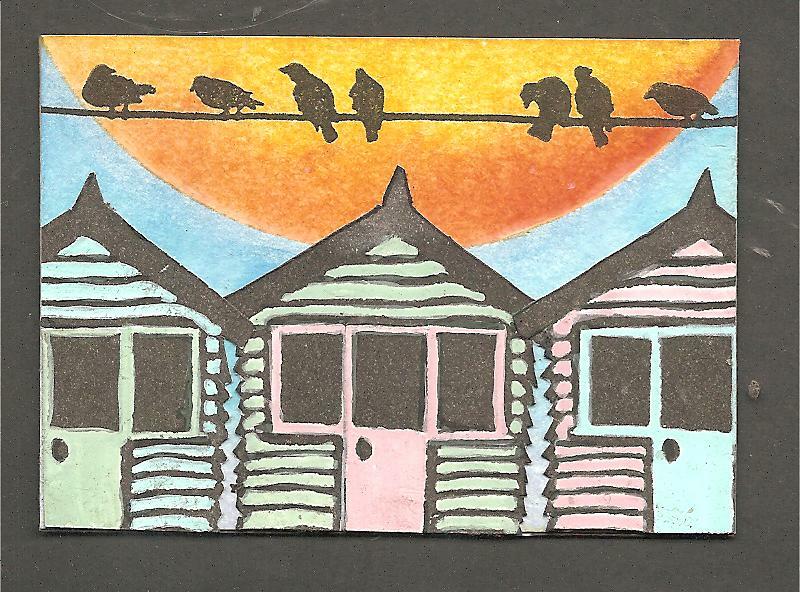 I adore beach huts! Thank you for reminding me of sunny days, as the rain thunders down on the conservatory roof. Well I think you did a wonderful job it's so bright and colourful... love everything about it. Hope you feel better soon and that you get a good nights sleep too. This is so happy! I love the colors! Sleep well. 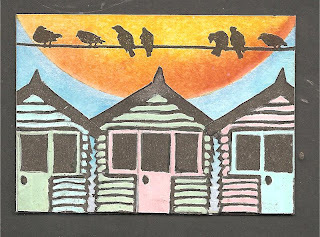 Love the final effect, gorgeous sun and the huts are fab, Penny! Loving the beach huts and I've never managed brayering successfully either - I like the sponged sun it's awesome! Love the beach huts! Keep going with the brayering. Thanks for the lovely comment you left on my blog. It might not be quite what you intended, but I think it's wonderful. Fantastic! Love the birds silhouettes against the sun!